The server is the IMAP server given to you by your mail service provider. System and network administrators usually name servers clearly. An IMAP server might have a domain name like "imap.server.host.com". If this is true for your mail provider, you can tell the type of server from the first part of the server's address. Even if the name does not reveal it, your system administrator should tell you what kind of server it is. Simply follow their instructions. 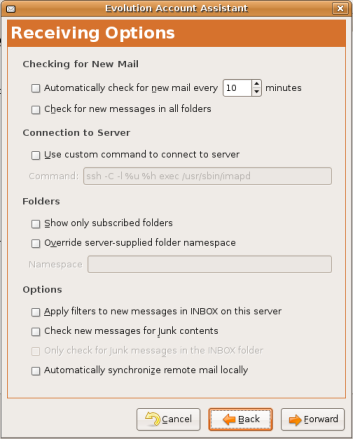 If your mail server does not use IMAP, choose a different server type. In Evolution, click on "Back" and do so. Recall that the server types are in the drop down menu. If you are unsure of the type of mail server your network uses and cannot tell the type from the address, contact your system administrator to find out. The username which Evolution plugs into the username field by default is imported from the name you gave on the first page. It is lowercase here because all mail account logins are lowercase by default. If you use a different login for your email, simply change this field to suit your needs. Like most email programs, Evolution retrieves your email without encryption by default (i.e., using "plain text"). If you need or want encryption, you must tell it to use TLS or SSL encryption. If your email service provider has not told you to use encryption, do not try either form of encryption -- it will only cause a fault in mail retrieval. Using SSL to access a server that does not support it is like speaking a foreign language to someone who does not understand it. Finally, you can tell Evolution to use a particular type of authentication. Most of the time, you will only need to use a password with your username. Other kinds of authentication are available, however. If you do not know which one to use, simply use the default: "Password". If you want Evolution to remember your password and not to ask you for it everytime it checks for new messages, tick the box next to "Remember password". Evolution will ask you for the password the first time you check for messages and will then remember it. The first option on this window reflects how long Evolution waits between mail checks. 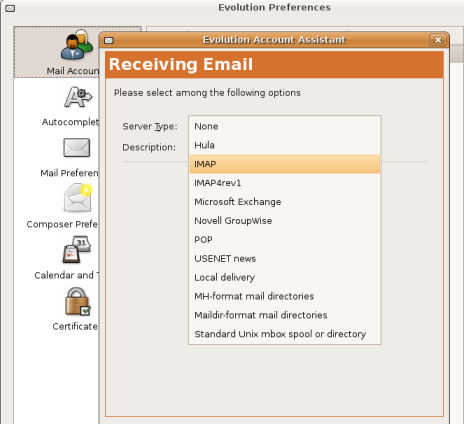 If the box is not ticked, Evolution will not automatically check for new mail. Ticking the second box tells Evolution to check all folders for new mail. This is in case the mail is sorted on the server. If you require special options to be set in order to connect to the server, you can here issue a custom command to connect to the server. If you do not know what this is, do not worry about it. If you needed it, your system administrator should have provided it for you. The first option is for showing only subscribed folders. If the address you are checking is used by several people or for several purposes, you are likely to sort your mail on the server. The mail then goes into specific subfolders to which you subscribe. Here you can tell Evolution to ignore the rest. If you prefer to give your folders names other than those used on the server, you can set them with the second option. The first box is to apply your mail filters to new IMAP messages. If you have mail filters setup, you can have Evolution apply them to new messages on the server. Note that the filters are only applied to the IMAP INBOX. It is assumed that the other folders are pre-sorted. Second, all new messages can be tested for junk contents. Simply tick the second box. The third option is for restricting junk mail checking. If you would like to speed up the time it takes to check for junk mail, you can restrict such checking to the INBOX. 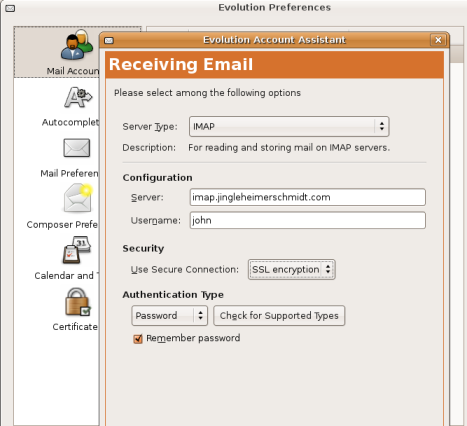 If you would rather not bother with telling Evolution when to check mail, you can automate it. Simply tick the last box, and your mail will be synchronised automatically. When you are done with these email retrieval options, click "Forward" to tell Evolution how you want to send your email.